Pyridoxal-phosphate (PLP, pyridoxal-5'-phosphate, P5P) is a prosthetic group of certain enzymes. PLP is also the active form of vitamin B6, which comprises three natural organic compounds, pyridoxal and pyridoxamine. This co-factor acts as an electron sink to stabilize carbanionic intermediates in both substitution and elimination reactions involving aminated compounds. PLP acts as a coenzyme in all transamination reactions, and in certain decarboxylation, deamination, and racemization reactions of amino acids. 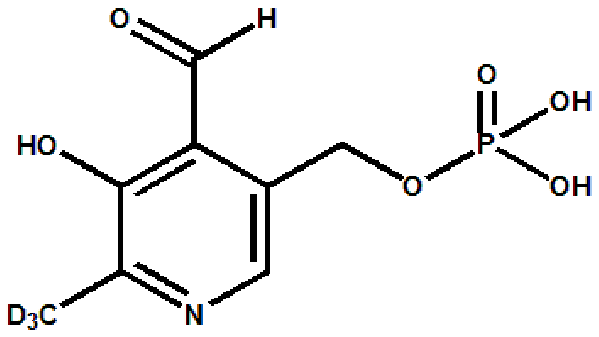 PLP plays a role in the conversion of levodopa into dopamine, facilitates the conversion of the excitatory neurotransmitter glutamate to the inhibitory neurotransmitter GABA, and allows SAM to be decarboxylated to form propylamine, which is a precursor to polyamines. A stable isotope dilution LC-ESI-MS/MS method for the quantification of pyridoxal-5'-phosphate in whole blood. The intestine plays a substantial role in human vitamin B6 metabolism: a Caco-2 cell model. Quantification of vitamin B6 vitamers in human cerebrospinal fluid by ultra performance liquid chromatography–tandem mass spectrometry.